Cooper’s Hawk Winery & Restaurant opened Monday, Nov. 3 in Springfield’s White Oaks Mall, in the long-vacant space once occupied by Kerasotes movie theaters. The Cooper’s Hawk brand is handcrafted wine and modern casual dining. So far, response to the upscale restaurant has been enthusiastic. Reservations for weekend dining are being made six or seven days ahead. The Springfield restaurant is Cooper’s Hawk company’s 17th location. Owner Tim McEnery started the first restaurant in Orland Park, Illinois, in 2005. His business expanded with restaurants in Naperville, Arlington Heights, Wheeling, Burr Ridge and South Barrington. The company has restaurants as far away as Tampa and Orlando. Each one is specially designed for each particular location. Wine is a major part of the Cooper’s Hawk operation, and there is a tasting room as you enter the Springfield restaurant. For $7 one can try eight different house wines. Wine aficionados can sample wines while waiting for a table, or just come to taste wines any time. More than 40 varieties of wine are available at the restaurant, from Cooper’s Hawk White (Bin 75) at $13.99 to Lux Pinot Noir (Bin 87) at $37.99. Grapes are imported from California, Washington state and other regions, and CH wines are produced in the company’s plant in Countryside, Illinois. 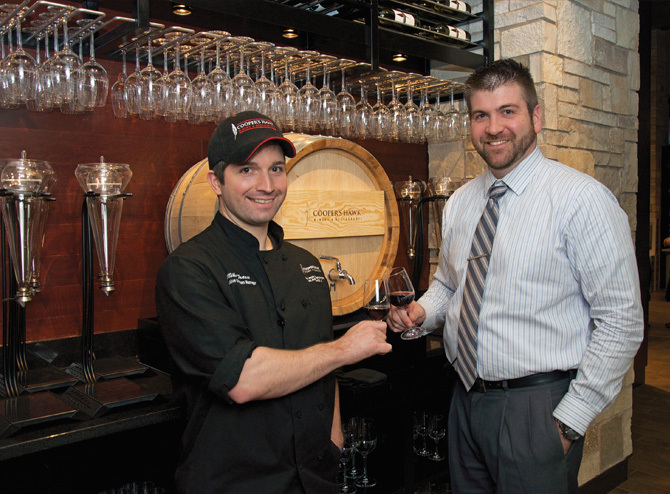 According to General Manager Ryan Delisi, Springfield’s Cooper’s Hawk is the only location to offer their Winemakers Barrel Reserve, a full-bodied red wine, straight from the barrel. The Cooper’s Hawk menu is created to pair with the company’s wines. For example, Anne’s Chicken Saltimbocca, with prosciutto, Provolone, garlic, sage and artichoke hearts is paired with a unoaked Chardonnay from Bin 70. All food is freshly made from scratch in a spacious kitchen, except for the bread, which comes from a Chicago bakery. Cooper’s Hawk restaurants do not use local produce and meats in order for their dishes to be consistent between locations. Appetizers include chicken potstickers, Mexican drunken shrimp and roasted vegetable and goat cheese flatbread. There is even an entire gluten-free menu at Cooper’s Hawk. Diners on a gluten-free diet can choose from 34 items including Thai Lettuce Wraps, Caesar Pesto Salad, Southwest Chicken Sandwich, Cooper’s Hawk Chicken Giardiniera and Filet Mignon. Five GF side dishes are on the menu, as are a Chocolate Truffle and Chocolate Brownie for dessert. The staff appears to be very well trained, knowledgeable and friendly. 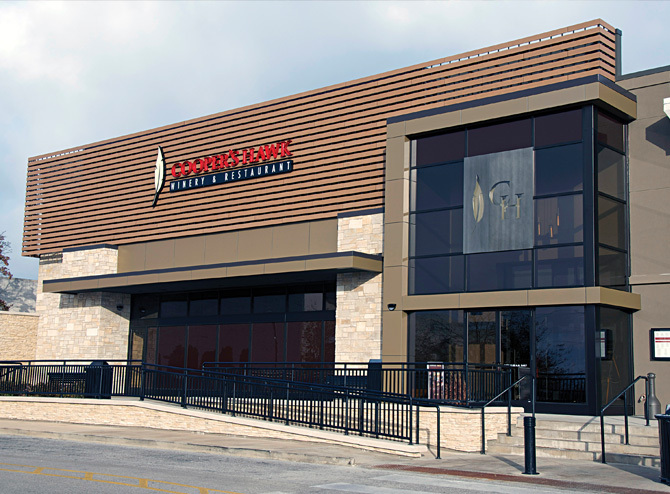 General manager Ryan Delisi was promoted from a Cooper’s Hawk restaurant in Chesterfield, Missouri, and moved here in June to prepare for the Springfield opening. He interviewed probably 700 people before hiring 150 employees, plus management staff. The new hires were then trained for eight days by staff from other Cooper’s Hawk restaurants who were working in Springfield for weeks. The ambiance is low-light with black tables and chairs and rough-hewn wood rafters. Once inside, it is easy for visitors to forget that they are at the mall. The restaurant has 100 tables, including the bar area. The bar is full-service, so visitors can order anything from the menu. The barrel room may be rented for parties and private events. Cooper’s Hawk has a Wine of the Month Club featuring one of their new release wines plus other benefits for $18.99 per month. See chwinery.com for more information. “We’re proud to be associated with Cooper’s Hawk,” Dave Dawson, White Oaks Mall’s director of marketing and business development, said. “Our recent renovation has taken White Oaks Mall to the next level, and having Cooper’s Hawk at the mall is good for the west side of town. “Cooper’s Hawk is a great complement to the mall,” he added, “and there are more exciting things to come too.” White Oaks Mall is run by the Simon Property Group, and this is their second partnership with Cooper’s Hawk, the other being a mall in Orlando, Florida.